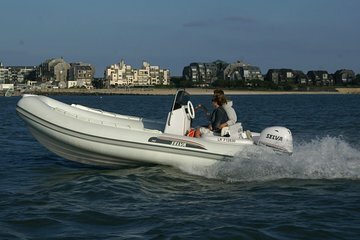 Enjoy an exhilarating full-day cruise on-board your very own RIB (rigid-inflatable boat) with this boat rental from La Rochelle and explore the scenic harbor, the lively port towns of the Île de Ré or the beautiful beaches of the Île d’Aix.You’ll need a boat license to drive the boat, but up to eight passengers can ride on-board, so it’s a great choice for families or those traveling in a group. The listed price does not include a fuel surcharge, payable at the end of the tour. The fuel surcharge is required by our local supplier and is not within our control.